4-Word Review: Dracula dates fashion model. After being kicked out of his castle by the Romanian government Count Dracula (George Hamilton) moves to New York City where he starts up a relationship with the beautiful, but troubled fashion model Cindy (Susan Saint James). Her boyfriend Jeffrey (Richard Benjamin) who also acts as her psychiatrist, is not pleased by this and becomes obsessed with destroying the count by using all the old vampire killing methods, but the count always stays one step ahead of him, which is enough to send Jeffrey to the mental hospital. Although this film isn’t well remembered it was a big hit when it came out and a comeback movie of sorts for Hamilton whose dramatic leading man roles during the 60’s and early 70’s had completely dried-up by this time. His foray into comedy was a last ditch effort to save his floundering career and the gamble paid off as he’s quite funny and almost like a natural. Saint James on-the-other-hand seemed too old for her role as she was already in her mid-30’s, but she manages to pull it off surprisingly well. Normally having a film character invite a stranger, in this case the Count, who she has just met at a club back to her place would be considered insane, but here it works as a nice satire on the one-night-stand fad of the 70’s and the on-going conversation that the two have as they proceed to make-out is by far the funniest bit in the film. I also liked how her messy apartment nicely reflected her screwed-up life and personality. Unfortunately the film falls flat when it introduces the Jeffrey character. Benjamin has played this obnoxious jerk-type one time too often and although he is quite good at it, it was still getting to be old shtick and it’s easy to see why he quit acting soon after and went into directing. The whole thing would’ve worked better had it focused exclusively on Saint James and Hamilton and analyzed their attempts to make their offbeat relationship work, which could’ve put a fresh spin on the vampire theme instead of devolving it into Jeffrey’s dumb attempts at trying to destroy the Count by using all the cliched methods like garlic, mirrors, etc., which quickly becomes stale and cartoonish. The film does have a lot of famous cameos including the two stars of ‘The Jeffersons’ TV-show who appear separately in bit parts. Arte Johnson also successfully hams it up as the Count’s faithful assistant in a comic send-up of Dwight Frye’s role in Dracula. Overall though there’s more misses than hits, which includes the ill-advised flying bat special effects that comes off looking so hokey that it almost demotes this to a B-movie level. 4-Word Review: Singer on the run. 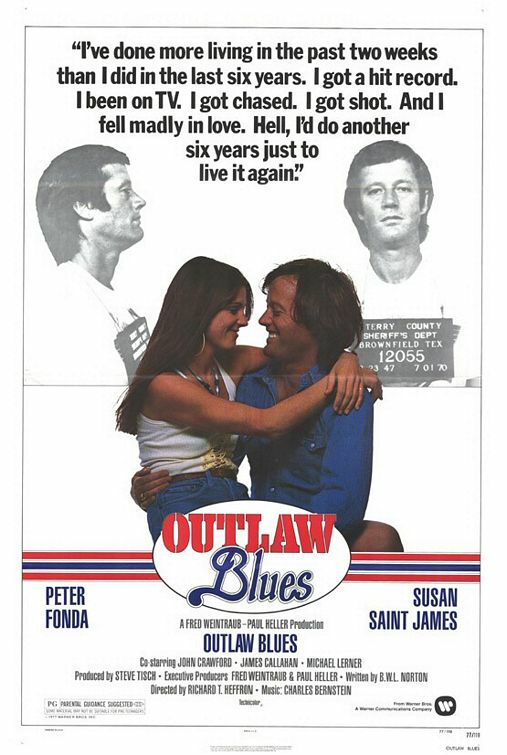 When country music giant Garland Dupree (James T. Callahan) visits a Texas prison in order to hold a Johnny Cash-like concert for the inmates he meets up with Bobby Ogden (Peter Fonda) a prisoner who while spending time in jail has written a song called ‘Outlaw Blues’. Garland likes the song so much that he decides to steal it and make it his own only to be confronted by Bobby who once out on parole will stop at nothing to get it back and expose Garland for the fraud he is. With the help of Tina (Susan Saint James) who acts as his manager he does just that, but finds himself again on the run from the cops after accidently shooting Garland during a confrontation inside a recording studio. This film is notable for not only being filmed in Austin, Texas, but also being the first film to ever use Austin as a setting. The movie can be fun for people from the area especially those living in the city during the mid-‘70s. There are a lot of car chases that occur in the center of town making it entertaining to see all the old buildings some of which still stand today. The scene that takes place at what was then called Texas Memorial stadium during halftime of a Longhorn’s football game where Tina and Bobby take part as members of the marching band is pretty cool as is Tina’s serene houseboat that she lives in and has docked on the Colorado River. Unfortunately the story itself evolves little and relies heavily on a lot of car chases and clichéd one-dimensional characters. Bobby’s hit song is too low key and melodic making it hard to imagine why so many people would get so crazy about it as a more up tempo country/rock sound would have worked better and given the soundtrack more of a kick. The film also suffers from a few goofs and lapses of logic. The biggest one is when a lone cameraman films Bobby accidently shooting Garland and it gets replayed on the evening news. Yet when it gets shown it has several edits and footage of the incident from different viewpoints and angles, which if truly shot by just one camera wouldn’t have been possible. The idea of having Garland chasing Bobby down through the streets of Austin in broad daylight while shooting at him is utterly insane even for a deluded, egotistical character that he is as it would just get him thrown into jail. Since the Garland character is portrayed as having a lot of money then he should do what most rich people do when they want someone dead, which is hire someone else to do it while creatively covering up the paper trail. Fonda too laid back in the lead and comes off as transparent and boring. Saint James, Callahan and John Crawford as an obsessed police chief lend some amusing support, but their presence as well as a nifty boat chase at the end cannot save a film that is otherwise generic and silly.